When you think of things to do in Kandy the big-ticket attractions are what probably come to mind, places like the Temple of The Tooth and the Botanical Gardens are world famous. But there are plenty of other things to do in Kandy Sri Lanka, some of them free, that we’ll share with you here. Just exploring Kandy on foot, walking around the lake, popping into temples and enjoying tea and cakes in one of the many bakeries, is a lovely way to spend some time in Sri Lanka. 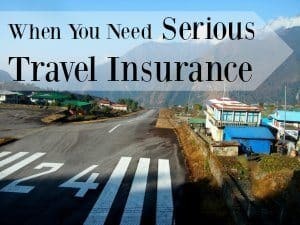 You can also make day trips from Kandy to nearby places of interest and to see historic sites, we’ll also talk about these places to visit in this post. It’s possible to book a 1 day private tour of Kandy if you’d like somebody else to do the organising, full details are here. Getting to and from Kandy, briefly. The stunning Tmple of The Sacred Tooth Relic on the shore of Kandy Lake. The Temple of the Sacred Tooth Relic is located inside the Royal Palace of Kandy, on the shore of the lake, and is justifiably the biggest tourist draw in Kandy. This Buddhist temple receives pilgrims from all over the world to be near the tooth relic of Gautama Buddha. Peradeniya, the Botanic Gardens, grows over 4,000 species of plant and is about 5.5 km west of Kandy. It attracts over 2 million visitors per year. Newcomers to tropical botany will love this experience, the large collection of orchids is particularly spectacular. You will also find medicinal plants and spices. The National Herbarium of Sri Lanka is next door. Walk up the hill to this nature reserve and old royal park from Kandy town centre. There is an admission fee. It’s a lovely area for a walk surrounded by animals, tropical plants and birds. Take water, it gets very hot walking on the hillside. 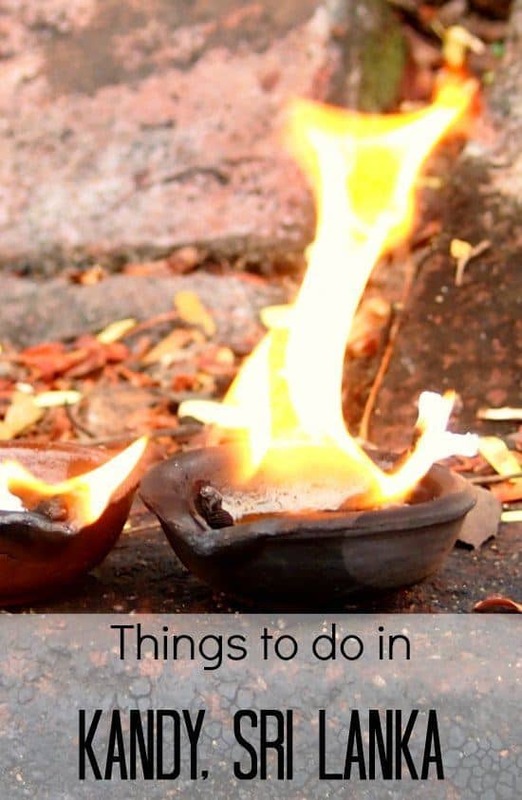 You can watch Kandian dancing and firewalking every night near Kandy lake. 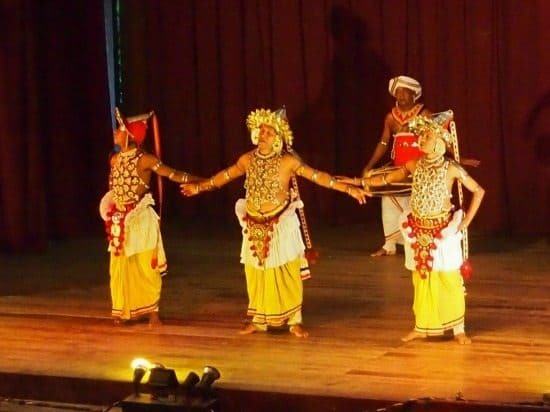 The nightly cultural show at the Kandyan Art Association Hall in Kandy is fairly inexpensive ( 500Rs), not too long, entertaining, unusual and great fun for the kids. There is lots of acrobatics and the dances represent aspects of Sri Lankan life, from snake charmers and cobras to beautiful peacocks. We particularly enjoyed the fire walking at the end of the show. Our guest house owner arranged discounted tickets for us, admission for the children was free. Watch out for lakeside ticket touts for the dance show, there are plenty about, they charge more. The show starts at 5.30pm. The National Museum, Kandy is here, along with the International Buddhist Museum. You can take day trips from Kandy to many interesting places to visit, including Dambulla, Sigirya or Pinewalla. 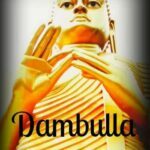 You’ll find full details on how to visit Dambulla from Kandy here. Other than these big attractions, you can fill your days very easily with free and low cost things to do and have a fabulous time in beautiful Kandy. Kandy is a wonderful city. Civilised is a word I keep using about Sri Lanka, you take your tea in fine china cups, people have beautiful manners and are often extremely well dressed. The Kandy ladies in their tasteful saris are quite spectacular. Sure, there is the odd tout looking to get their hands on your money, and sometimes there are beggars to tug at your heartstrings, this is the real world after-all, but on the whole everything is very lovely. We’ve spent weeks in Kandy now, mostly doing what many would consider not much at all, this is how we like to fill our days. 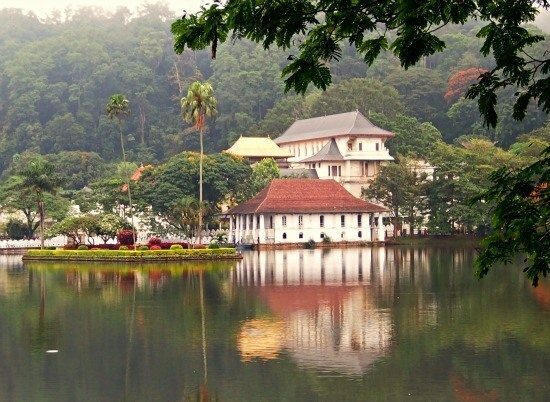 For botanists or wildlife lovers, a walk around Kandy Lake is a must-do. I think we spent most of our time in Kandy just walking around the lake having a really pleasant time. 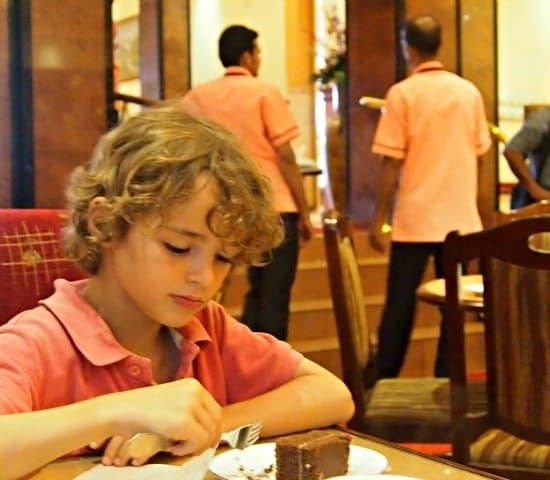 This has to be our favourite of the things to do in Kandy with the kids. The boys were blown away by the wildlife we spotted. 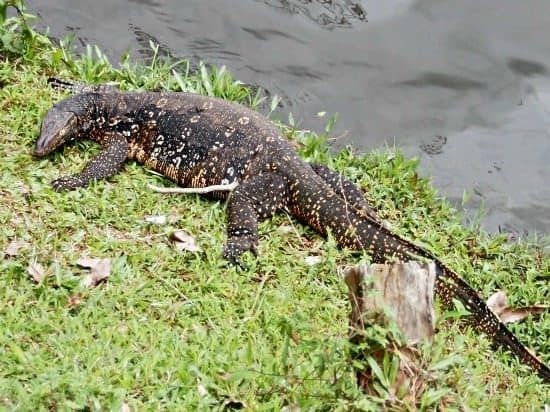 Huge monitor lizards swam in the water or basked on the lake’s bank almost close enough to touch. The lake is relatively clean and clear, you can see, and feed, the fish. Spot the turtles on fallen tree branches. Birds are everywhere, ducks, a pelican, two types of kingfisher and cormorants kept my boys amused. The trees around Kandy lake are labelled with their botanical names, another talking point. Parent Tip: There is a kids playground and small restaurant at the far end of Kandy Lake. Near the Temple of the Tooth, you will find extensive and fascinating temple complexes. Take half a day to explore. These ancient temples are free to enter and are a wonderful cultural experience. Read more about our morning exploring the Devales here. China teapots, fine Sri Lankan tea and chocolate cake on Kandy’s main street in one of several tea rooms. The main road in Kandy has a collection of tea shops and bakeries. Morning tea and a chocolate cake became our family tradition in Kandy. Sri Lankan breakfasts are some of the finest in the world. Try Devon Tea Rooms on the main street. This photo was taken in Ella. 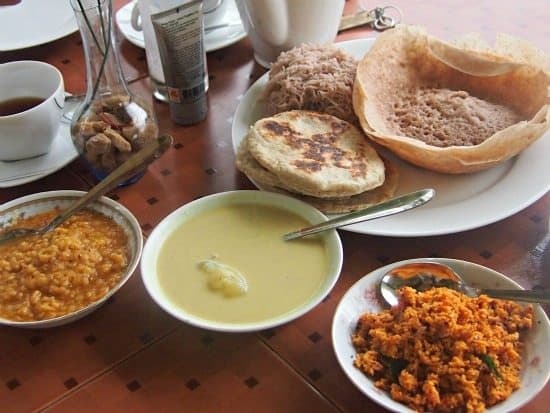 Try the breakfasts, hoppers and curry. Or try a cheese and egg hopper later in the day. We all enjoyed both and quickly got the hang of eating runny curry and hoppers with our fingers. ( don’t know what a hopper is? click here). 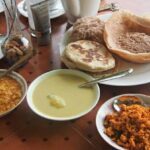 The best Sri Lankan breakfasts of our whole trip were at Devon tea rooms in Kandy. Love that potato curry! 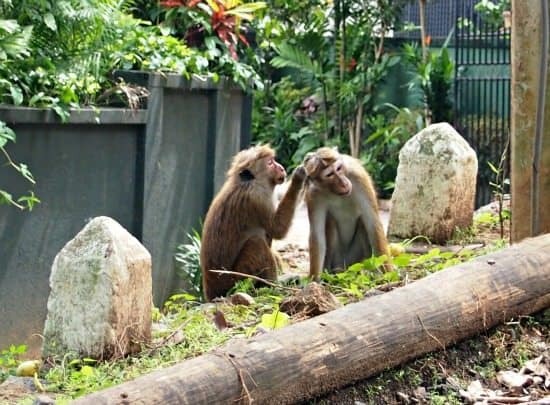 Love them or hate them, the monkeys are everywhere. There are monkeys everywhere ( click to see how they invaded our hotel) around the lake and up the hills. You may not notice them at first, but sooner or later you’ll find them, or them you. They’re not aggressive, like monkeys in Ubud, Bali, probably because they’re used to people seeing them off rather than feeding them. They’re great fun to watch, we spotted a troop happily going through some poor person’s laundry. Listen for the bangs of the monkey scaring fireworks, they’ll tell you where the monkeys are. You’ll find a modern shopping centre on Kandy’s main street and pleasant gift, souvenir and clothes shops nearby. There is a nice little shopping centre on the main street in Kandy. We started stocking up on cold weather clothes here, jeans, shirts and a dress for me. Clothes are good quality and at great prices. 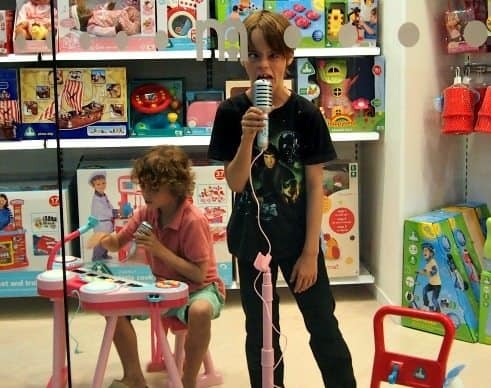 The kids had fun in the toy shops and we all enjoyed the more up-market souvenir shops. I’d highly recommend the book shops in Kandy for educational books for kids, they’re all in English and they’re great. Escape the air conditioned tourist tour buses and take a tuk tuk ride up to a lake view point or a bus to a nearby attraction. 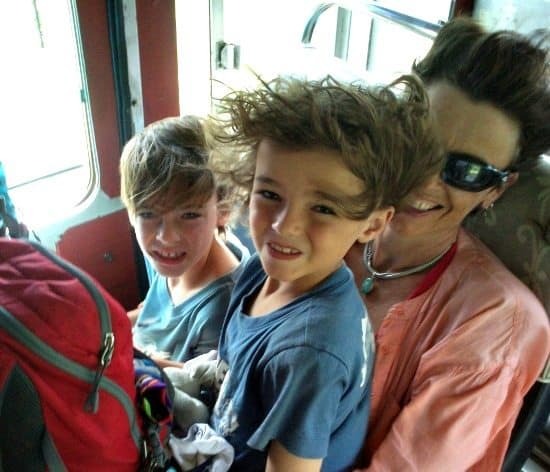 If you or your children are new to Asia, you’ll love riding in the back of a crazy tuk tuk or 3 wheel taxi. A family of 4 fits easily, despite appearances. Buses in Sri Lanka are fun too, they usually have decorations, lights and music on board and people are wonderful with kids. Be ready for a high speed ride! 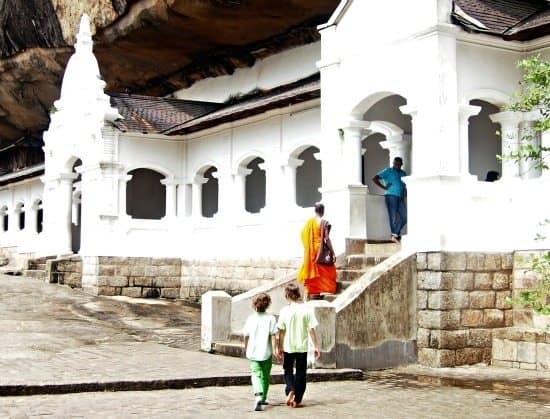 You can easily take the public bus to nearby places to see, such as Dambulla cave temples. For the Big Buddah on the hill or other view points around Kandy, consider a tuk tuk. Explore the grave yard with a worker, eager to share history with you in exchange fr a small tip. It’s quite fascinating. Up the hill behind the Temple of the Tooth and the National Museum is the British Garrison Cemetery ( read more here). A touching reminder of how tough life was for early European residents. 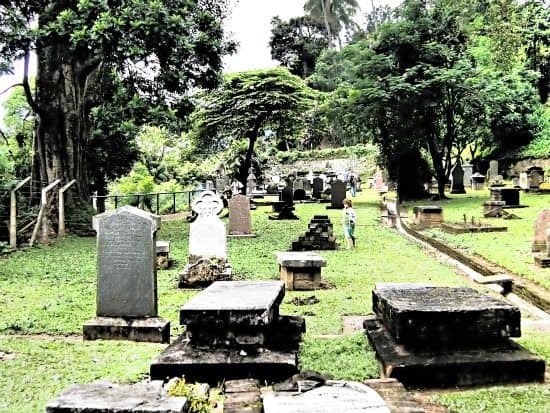 A young cemetery worker showed us around, he had memorised every inscription on every grave and could tell us all about the men, women and children who died while stationed in Sri Lanka. They were mostly very young, death came from malaria, typhoid or wild elephants. We gave him a tip and promised to send him a photo. The boys were most interested in the monkey trap and wild pig footprints in the cemetery, but I think they got a little history out of our visit. You can take the local bus for a day trip to Dambulla cave temples, or journey on to your next stop, near Sigiriya. Most tourists in Sri Lanka hire private drivers to take them around the famous sites. That’s the way we did it on our first visits. 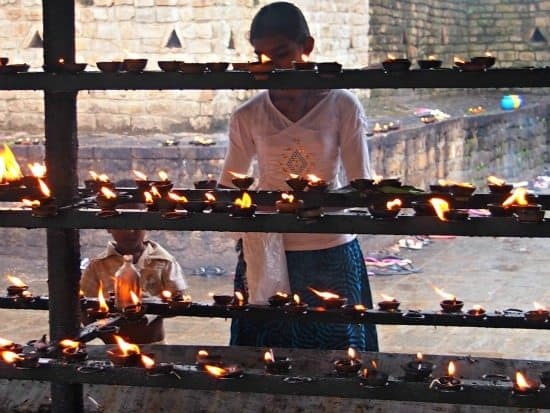 On a tighter budget we picked just one big attraction, Dambulla cave temples, and did it our way, on the cheap, by bus, click here to see how. We skipped Sigyria that year, I was a little concerned about the hornets going for my less-than-quiet children. We have since taken the kids to Sigiriya and had a great time. It was very easy to catch the bus to Dambulla and back from Kandy bus station, although it was quite a long day. The admission charges are still steep, but at least we saved on transport. I honestly don’t know if it was worth going. It’s a lovely site and we enjoyed it, but we were having a great time just hanging around Kandy. There is a pub in Kandy, it’s called “The Pub” and it’s on the main street, on the 2nd floor with a balcony to sit and watch the world go by. We’d never been to a pub in Sri Lanka so we thought it was worth a try. We’d seen a couple of pubs in Ella in the hill country, mostly frequented by locals, but mostly in Asia we have a drink with our dinner. It’s harder to do that in Kandy. We love Sri Lanka and Kandy is one of the highlights, even on our third and fourth visits to Sri Lanka, we always go back. We never struggle to find things to do in Kandy with the children. 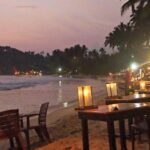 All of the usual online hotel, hostel and guest house booking engines work fine for Kandy and Sri Lanka. Hotels Combined compares a lot of the big sites at once ( Including Hotels.com, so you can still get your points to use against free stays) Agoda are the Asia specialists, you need to check their exclusive deals separately as Hotels Combined don’t check them. If Booking.com is your favourite that’s fine too, click through and use them. There are abundant luxury hotels in and around Kandy, many in the surrounding lush green hills. You will also find cheaper backpacker accommodation, hostels and guest houses. Check the booking engines above. We usually get to Kandy by train from Colombo or from Ella and the highlands. In 2015 we went from Kandy back to the coast ( via Colombo Fort) for more beach paradise in our favourite spot, Mirissa. 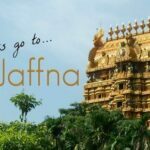 In 2016 we continued north from Kandy, to Anuradhapura’s Ancient City ( read more here) and from there to unspoilt Jaffna in the very far north. Great article! On my last visit to Sri Lanka we stayed in Kandy on a short visit. I loved it so much, my husband and I are planning a family trip this year. I always felt Kandy and the hill country was a part of Sri Lanka I wanted to explore more. so this article is a great help! Great.. cant wait to go there now. My husband is dying to go to srilanka, one of the many reason having srilankan friends ? I’ll be reading all your tips! Hi Megan, thanks for reading and thanks even more for commenting. Have a great trip! This is great! Thank you! I didn’t really want to go to Kandy based on many lacklustre comments from travellers about it. And I really didn’t think it was worth going to Kandy just to visit the Temple of the Tooth. So this has given me some confidence in going there! Is there a particular drum show that you went to? On the far side of Kandy Lake, there is a cultural centre, they have nightly shows. I think poor reviews come from people on flying visits Jacquie, not people who spend a few more days there. A lot depends on your accommodation and hosts two, our owners were so lovely. I try not to mention elephants because people get upset about animal cruelty. But if you go to the post about the Kandy Devales you’ll see that there are temple elephants around there and sometimes around the Temple of the Tooth. They use elephants in the annual Kandy Perahera held in July-Auugust. Other than that there is Pinnewala Elephant Orphanage, it’s a long way from Kandy, a big drive. Some people even say that is cruel, I’ve been twice and saw no evidence of elephant abuse. 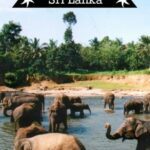 There are numerous elephant attractions on the way out to Pinnewala where you can wash an elephant, ride them etc. Those, I wouldn’t touch. Enjoy your trip! Thanks so much for this!! We are starting 10 months around the world in September and Sri Lanka has been a recent addition to our trip. We love all your Sri Lanka posts! We’re thinking of basing in Kandy so this is great. Thank you – have a good weekend!